Puerto Rico's recent history of municipal bond defaults has highlighted the potential benefits of a niche part of the municipal (muni) bond market - insured municipal bonds. Insured munis accounted for 6% of all municipal issuance in the first half of 2018,1 but we believe these can play a role for investors who want assurance that their bonds' interest and principal will be paid on time - even if the issuer defaults. Municipal bond insurance companies issue insurance policies on muni bonds, which guarantee that the insurance company will make timely interest and principal payments on those bonds in the event that the issuer defaults. The cost of the policy is reflected in the bonds' yields - an insured bond will typically have a somewhat lower yield than an identical uninsured bond. However, the true value of the policy can be seen when an issuer gets into financial trouble. 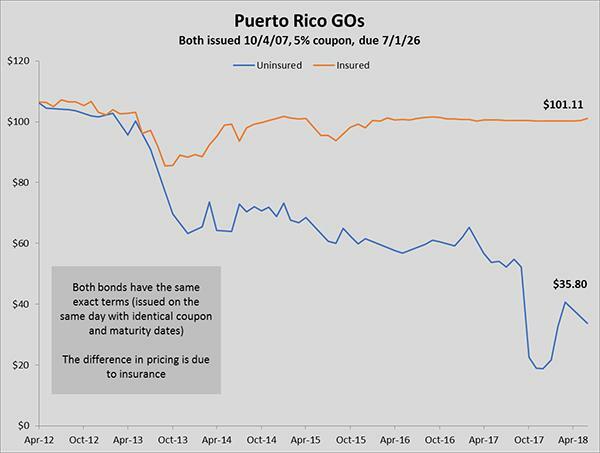 The chart below shows pricing for two Puerto Rico general obligation bonds with identical terms - but one is uninsured and the other is insured by Assured Guaranty. The insured bonds performed over 65 points better than the uninsured bonds following Puerto Rico's defaults. One municipal bond insurer with exposure to Puerto Rico - Assured Guaranty (AA/stable) - had its ratings affirmed by Standard & Poor's (S&P) in June 2018. Build America Mutual (AA/stable), a municipal bond insurer with no exposure to Puerto Rico, also had its ratings affirmed by S&P in June 2018. We then purchase the "new" insured bond from the broker-dealer. Municipal securities are subject to the risk that legislative or economic conditions could affect an issuer's ability to make payments of principal and/or interest. Puerto Rico's economic problems increase the risks associated with investing in Puerto Rican municipal obligations, including the risk of potential issuer default, and heighten the risk that the prices of Puerto Rican municipal obligations, and the fund's net asset value, will experience greater volatility. See the prospectus for more information. Ratings are based on S&P. A credit rating is an assessment provided by a nationally recognized statistical rating organization (NRSRO) of the creditworthiness of an issuer with respect to debt obligations, including specific securities, money market instruments or other debts. Ratings are measured on a scale that generally ranges from AAA (highest) to D (lowest); ratings are subject to change without notice. NR indicates the debtor was not rated and should not be interpreted as indicating low quality. If securities are rated differently by the rating agencies, the higher rating is applied. Credit ratings are based largely on the rating agency's investment analysis at the time of rating, and the rating assigned to any particular security is not necessarily a reflection of the issuer's current financial condition. The rating assigned to a security by a rating agency does not necessarily reflect its assessment of the volatility of a security's market value or of the liquidity of an investment in the security. For more information on the rating methodology, please visit http://www.standardandpoors.com and select "Understanding Ratings" under Ratings Resources on the home page. ©2018 Invesco Ltd. All rights reserved.